Really happy with this, my 2nd shark helmet as no others seem to fit my fat head or glasses. 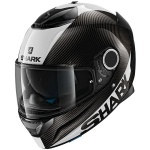 Really lightweight, good ventilation and the service from sportsbikeshop was spot on as ever. haven't tried on bike yet but quality wise its superb. Not on par with my Gt air in terms of build quality but aesthetically blows it away. Has a higher sharp rating than my GT air too! Sunvisor is lovely and comes down all the way (other manufacturers take note please!). Would have preferred slider for the sun visor to be on the side rather than on top. When you buy this helmet there are 2 different versions. the updated 1.2 and the older version. only difference I can tell is the liner in the updated version is different and much much better than the original version. the new version is black the older one dark blue. SBS as ever have epic customer service and I seem to keep giving them my money. I buy exclusively from them simply due to the customer service. Nice looking helmet, good fit and vision. Useful deep drop internal dark visor. Great quality helmet, whistles a little but that may be down to the screen on my bike as dipping head alters the sound a lot. This is a really light helmet! I bought it because I sometimes wear glasses and it was a really difficult to put them on with my old helmet. With this one it's easy. I like the in-built sun visor too. The only thing I'm not so keen on is the noise level in the helmet. My first Shark helmet, well what can I say, it's light a good fit. I have recently used it in a really heavy rain storm and surprisingly even with glasses on and the visor closed I had no problem with my glasses steaming up. 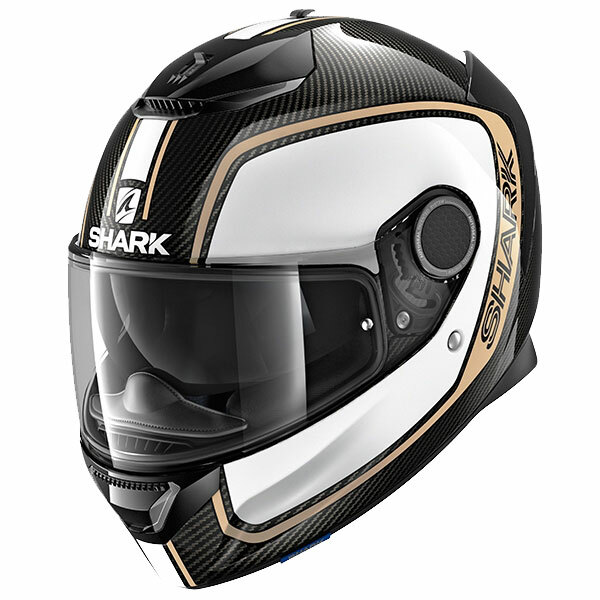 The first Shark I've purchased and a definitely step up in quality from the usual mid range ( ~400 GBP ) helmets I buy. MaxVision pinlock works very well, although the internal sun visor fogs very easily. Overall, very pleased. Seen this helmet on SPORTSBIKESHOP, price was as good as I seen anywhere and I have never had a problem with this firm so I bought it and am I pleased I did. So nice to wear, fits like a glove, very little noise without ear plugs. Sun visor works great, Pinlock perfect and the helmet looks great with my blue bike, more than happy with this buy, good choice. If any of you are looking for a helmet at the right price, and its so light this is the one as far as I'm concerned. Brilliant fit, and very comfortable. Nice and bright for other road users to see. Reasonable price for good quality. As a glasses wearer this is the best helmet for comfort and ease of getting glasses on and off I have ever had. Also the helmet ticks all the boxes. I bought this as for one could not find the pattern anywhere else and the price was brilliant. Local shop could not come close to matching it. Definitely an upgrade on my Arai Chaser V - lighter, quieter, better visor system (both on the bike and easier to remove) - plus the sun visor is great. Comes with the Pinlock insert too. More padding inside means a slightly tighter fit than the Aria (m-57), but not a bad thing. Only downside is that it wasn't as immediately comfortable at the Aria (or Shoei that I tried), with ears catching a little on the inside. Less of an issue as it wears in. Altogether very pleased with the product. And great service for SBS as always! When something is as good as this helmet there is no need for a fancy selling pitch. Been riding longer than I can remember,lost count of the lids good and bad but this is a keeper, great graphics,comfort and ultralight. What are you waiting for? Get down to sportsbikeshop and get yours! Fantastic helmet, really light and a great fit. Also I can wear pairs of glasses that will not fit with other helmets. I've only had a chance to wear it for 30 miles so I can review my experience so far. First impressions are that the lid looks amazing. The carbon finish is the nuts. It's super lightweight and build quality feels good. When I measured my head as suggested on Shark website I should have ordered a size L but I had tried it on in a shop previously and found an XL to be a better fit. They do say that is just a guide and the shape of your head makes a difference to fit, not just circumference. When riding it feels very comfortable and quiet. The aerodynamics seem perfect although when I look down while riding the seems to be some turbulence and wind noise. Not that you will be doing that much but will see how it goes with more use. Over all very happy so far. Very happy with my purchase and top quality service. .
Disclaimer: this is my first ever helmet and the basis of this review is extremely shallow in that I have little experience to which I can compare this helmet. Firstly, just look at the helmet. Click through the pictures, Google a video review. It looks absolutely stunning. It was a case of love at first sight when I came across the helmet. The carbon fibre skin is gorgeous and the colour scheme is gorgeous. I've had a couple other riders comment on how nice the helmet is when waiting at lights. The internal sun visor works really well and is easily deployed. The Pinlock insert works terrifically well in preventing the visor from misting up. I have been riding in very cold temperatures (3-4 degrees Celsius) and only the very extreme corner of the visor, where the Pinlock doesn't reach, most up slightly. The visor is somewhat tricky to remove - there is no release mechanism like with other brands as you simply have to *carefully* yank the visor off the helmet. The helmet is light and quiet. At speeds of 60+mph there is no whistling through the helmet whatsoever. The bar has been set very, very high by this, my first helmet. Great value for the money. Good finish and it's very light and for people wearing glasses easy to get them on with this crash helmet, highly recommended. Very satisfied with this Shark, which is the first one for me, very pleased.